It has been confirmed that two men have died in a crash of a light aircraft east of Compton Abbas Airfield near Shaftesbury. At 9.28am today, Saturday 26 August 2017, it was reported to Dorset Police that the Tiger Moth had come down and smoke was seen. Emergency services attended the scene to deal with the incident and the Air Accident Investigation Branch was informed. Chief Inspector Richard Bell, of Dorset Police, said: “Sadly, two men have died in the crash – the passenger, 67 years old and from Shaftesbury, and the pilot, 64 years old and from Blandford. “Our thoughts are very much with their families at this very difficult time. How safe is the air we breathe on planes? Many of us will be heading abroad on flights this summer - and ITV's Tonight team have been investigating whether enough is done to monitor toxin levels in cabins. Fred talked to ITV's Joel Hills who's been working on the investigation for the Tonight programme. A missing plane - which remains a mystery. A British Airways flight - crash landing at Heathrow. We've seen the reports on the news but, still, aircraft safety has come a long way since the early days of passenger travel. When planes do crash, the men and women of the Air Accident Investigation Branch are some of the first people to arrive. Many damaged craft are taken to the AAIB's base - at Farnborough - for further examination. The first ever summit to discuss solutions to the issue of aircraft noise is taking place today. Air bosses including the Chief Executive of Gatwick are taking part, as well as representatives from Heathrow. The Heathrow Association for the Control of Aircraft Noise are talking at the event too. Stewart Wingate has promised around 4000 households most affected by noise from a possible second runway there would get £1000 towards their council tax. RAF Halton in Buckinghamshire iscelebrating 100 years of military flying. The Centenary of Flight, which isalso the RAF’s 95th year, is a big achievement for the Wendover base andthe local population who have supported the military aviation. The first flight took place on September 18, 1913 as the aircraft from 3 Squadron of the Royal Flying Corps landed on the former Rothschild Estate. Within five years of Britain's first flight, the Army recognised the value of aircraft and used experimental airplane structures to gain information. Today the airfield is home to a variety of RAF light aircraft and an occasional visit from a spitfire and Hercules transport aircraft. Two men are recovering after their light aircraft crashed in woodland near Popham Airfield in Hampshire yesterday. The 44-year-old pilot suffered minor injuries and was described as "walking wounded". He was taken to Southampton General Hospital by air ambulance. The 60-year-old passenger was taken to hospital by coastguard helicopter with suspected fractures. It is not known where the men had taken off from or where they were travelling to when it came down. The crash caused significant delays on the A303 yesterday afternoon. 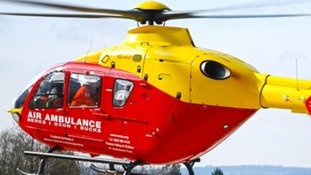 A man has been airlifted to hospital after a light aircraft crashed near Popham Airfield in Hampshire. He was initially given first aid by fire crews before being treated by paramedics. He was then been flown to Southampton General Hospital. Another man in the aircraft was able to walk to a stretcher. Both were conscious and neither had to be cut free. The men are believed to be aged 44 and 60. The crash has caused significant delays on the A303. A light aircraft has crashed near Popham airfield in Hampshire - injuring two people. Emergency services were called to a wooded areaa just south of the airfield near the A303. It is believed the pilot and passenger in the two-seater light aircraft have suffered life-threatening injuries. Fire crews are working on freeing the people from the aircraft. The coastguard helicopter has been tasked to airlift the men, aged 44 and 60, to Southampton General Hospital. The accident has caused long tailbacks on the A303 Westbound between M3 J8 / A30 (Andover) and A34 / A30. Air ambulances in our region have been cleared to fly again after they were grounded over fears the aircraft could be unsafe.